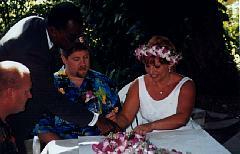 We had no prior idea that Jamaica was a popular place to get married. Our little group met Mike and Pamela on the bus ride from the airport to Dunns River. 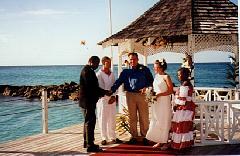 Mike and Pamela stayed at Sandals Ocho Rios, the next resort down the coast. 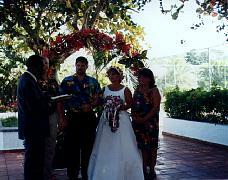 No one had accompanied this couple to witness their marriage, so Terry volunteered our group. 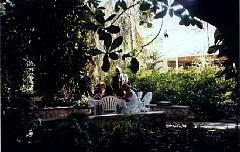 We got on the bus and rode down to the Ocho Rios resort for their marrige ceremony. The minister pronounced "Pamela" as "Pam eel e a". I don't remember Mike actually throwing Pamela in the Carribean, but I think it was close. 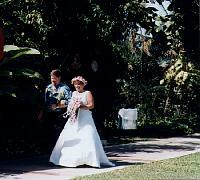 Terry and Chris (Box) arrive for their wedding ceremony. My camera has a hard time with exposure for these pictures. The sky is very bright, but we are under a leafy canopy. Terry and Chris and Mary and Jerry sign the official wedding papers. The Newlyweds pose for pictures. A curious thing happened all week at the Resort. 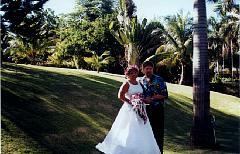 Several times different Newlywed couples came by the pool and Carribean to have their pictures taken. Resorters would always cheer, whoop, and holler congratulations as the happy couples posed for pictures.